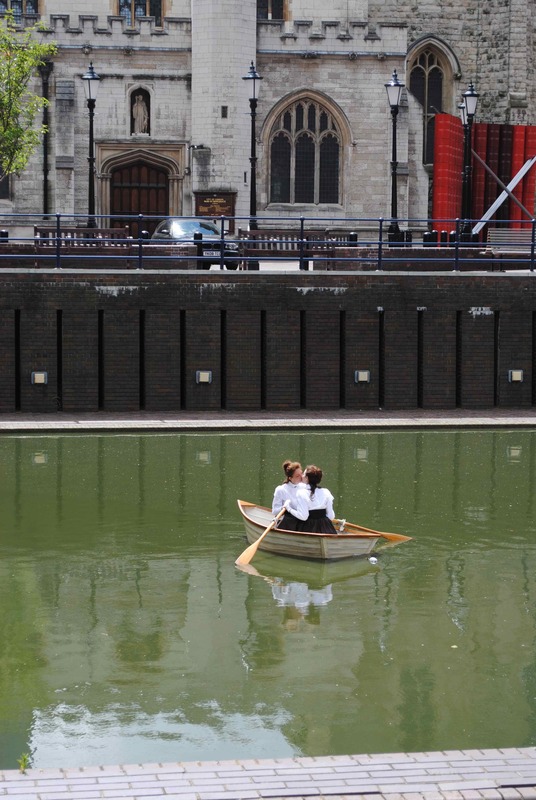 If, on a hot summer’s afternoon, you come across a couple of women in Edwardian dress kissing in a boat on the Barbican lake, the sight is likely to draw you up short. Prim kissing and no caresses, I should add – no sweaty, urgent clinches in the hull. But still, it’s intriguing. 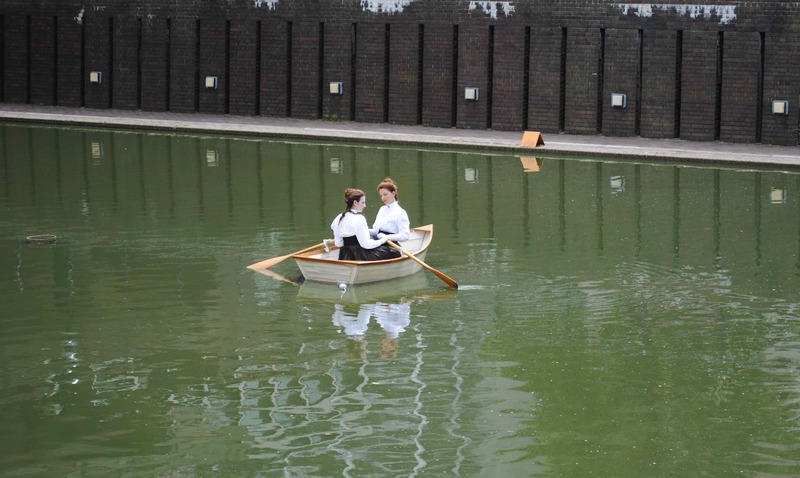 And it would have been even more charming if it had turned out that the women were lovers who liked to spend their Sunday afternoons rowing in Edwardian garb. But this was no private leisure activity, this was a public spectacle — this was art. Ah, the feeling of Mozart’s famous composition Second Movement of Piano Concerto 21. I didn’t manage retrieve that from my memory, and nor, I suspect, did many of the spectators. Best to concentrate on the spectacle. This was art as amusement and as photo opportunity. The concept, such as it was, ‘a mirrored scene of movement and symmetry…gentleness and tension’ was not especially interesting. Look at those ladies kissing in the boat, we thought but didn’t say. Though in fact the actors let the artist down: the kiss was not never-ending. It must have been hot and uncomfortable, sitting in that boat, in high collars and long skirts. A woman needs a break now and then. I took my photos and wandered on. There are many definitions of art and most of them are true, but I tend to the simpler, lazier view that in general art is simply what artists do. That said, art must surely be more than an amusement or diversion. I cling to the notion that art, when it works, should somehow stay with you after you’ve encountered it. There is so much art stuffed into London and so little of it leaves an imprint on the viewer. Did Second Movement make any difference to anyone on the terrace that day? I want to say, ‘Not to me’ but here I am writing about it. Of course, performance art is ephemeral, and not something that can be returned to in the way that, say, a painting in the National Gallery can be returned to. So this was a fleeting experience: equivocal, half-remembered, inadequately captured in photographs – like life itself.